Instagram Story Ads can now Include Poll Sticker to Maximize User Interactivity! Mark your calendars as Instagram is all set to incorporate poll sticker option in story ads, come Tuesday. The development is significant in the sense that Instagram has been working on making the Story feature Interactive to ensure maximum engagement and this trick might just be the spark which is needed. According to a blog post, the media sharing platform has almost 500 million visitors every day. In addition to that, 6 out of every 10 brands which use Stories to promote their product/service, make sure to include interactive elements in the feature such as @ mentions, locations etc. every month. Interestingly, Facebook and the apps associated with it have more than 7 million advertisers, out of which 2 million rely on Stories to fulfill their purpose on the platform. Thus, to take things up a notch and make the network even catchier for advertisers, Instagram is adding poll sticker, which can be used with the Stories. The feature will start to roll out globally from Tuesday. "We're inviting businesses to engage with audiences beyond their followers by using interactive elements in stories ads, starting with the polling sticker. ", announced Instagram Business Team. How it works is that Advertisers will have to choose Instagram Stories as their only ad placement option. The option can be accessed through Ads Manager. Once this is done, there should be a box titled, “Add an interactive poll”. They will have to check the box while the post is in its editing stage. 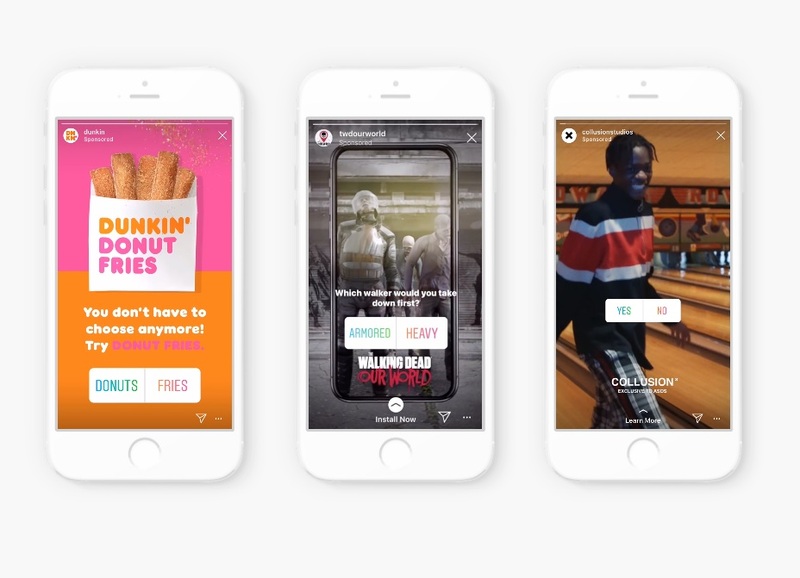 According to Instagram, 90% of the beta campaigns with the polling sticker feature performed significantly better than before, resulting in a remarkable increase in views of three-second videos, along with 20% reduction in cost per video view and 40% increase in app installs for Dunkin’ and Next Games respectively. Melanie Cohn, the senior manager of brand stewardship at Dunkin’, expressed in a blog post about the effectiveness of the feature, along with being grateful for the brand being a part of the test group. One other brand which was among the test group, “Asos”, promoted its new unisex fashion brand, “Collusion”. Hannah Craik, head of brand marketing, also had positive feedback about the feature. Craik was seemingly impressed with the users’ interactivity. She also mentioned how engaging with the audience can make them feel a part of the brand.